When I was a kid, the reason I loved going out for pancakes on a Sunday morning was the syrup. Or rather, the syrups. Any diner or pancake house that had a variety of syrups that included a couple of fruit-flavored ones got a big thumbs up in my book. I still like the touch that fruit adds to maple syrup and, when I happen to see a fruity syrup blend (meaning maple syrup + fruit), I pick it up. 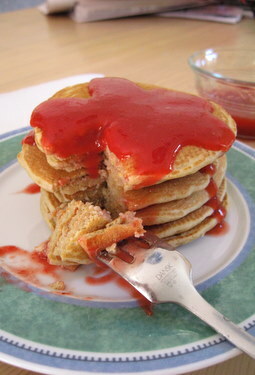 The syrup I used on these pancakes is strawberry. I couldn’t resist the red color or the way that the berries were set off by the sweet maple notes. Gorgeous, and tasty to boot! Instead of my basic buttermilk pancakes, I opted for something with a bit of whole wheat. I used white whole wheat flour in the pancakes and added sour cream in, instead of simply relying on buttermilk, to add some flavor and tenderness to the cakes. White whole wheat flour gives a good balance between regular whole wheat and all purpose, and is a great choice for something like pancakes where you don’t want them to be too dense – which is a possibility with some regular whole wheat flour pancakes, especially if you aren’t used to the difference between them and those made with all purpose flour. These pancakes are filling, although fortunately they are not too heavy. You can make these pancakes in any size you like. I opted (as usual) for about 4-inch rounds and got about 20 from this mix. This should easily be enough for four, and might be enough for 6, especially if you want to include a side of eggs or sausages, as well. In a large bowl, whisk together flour, sugar, baking soda and salt. In a small bowl, whisk together egg, sour cream and milk. Pour wet ingredients into dry ingredients and stir just until no lumps remain. Heat a skillet or griddle over medium-high heat until a drop of water placed on it skitters around the surface. If it instantly evaporates, turn down the temperature slightly. Drop by 1/4 cup fulls for larger pancakes, or two tablespoonfuls for 3-4-inch ones, into the preheated pan and cook until golden on both sides, turning once. Serve immediately, with maple (or strawberry!) syrup. We had a Thrifty’s Diner near us and my mom would take us for breakfast. They had the most delicious pancakes with boysenberry syrup. Oh, how I wish that diner was still around. Btw, where do you buy your white whole wheat flour? 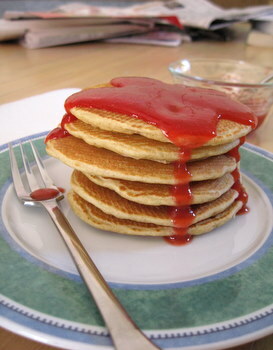 I used to cook hotpancake with melted strawberry jam for my children breakfast. They never got bored with it. I have tried to use syrup, but they prefer to use melted jam. I guess they like the rough texture from the jam. Other brands sell it, as well, but you need to keep an eye out for it. Mmm…I love pancakes! I’ve never made sour cream pancakes before but they sound [and look] delicious! I just made jam so I’m thinking it might be time for some pancakes. These look delicious! I love variations of pancakes. My current favorite is cornmeal pancakes.. delicious! I am most definitely going to try these pancakes this week at some point. Thanks for the recipe! Can I sub the sour cream with yogurt? Krystie – Yes, yogurt should work in place of the sour cream in these pancakes. Can you please tell me what is the different between white whole wheat flour, regular whole wheat flour and whole wheat flour? I wonder I can get these flour from Malaysia. I have tried this recipe. The batter is watery. 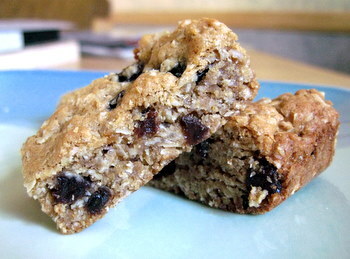 Is whole wheat flour the same as wholemeal flour. Michelle – I’m a little confused as to how your batter could have been watery. If you mean to say it was too thin for your tastes, you can always add in some extra flour. Whole grain flour and wholemeal flour are the same, but “white whole wheat flour” (which is what I used in the recipe) is not the same. looks delicious- do you make your own strawberry syrup? Hi, I am going to try this recipe tonight! Thank you for posting it. There are hard and soft wheat varieties. Hard red or white (color) wheat is your bread wheat has the highest gluten content and rises best. Soft wheats have a lower gluten content so do not rise well and are used for pastries, cakes and pancakes. I am not sure if the author of the recipe used hard or soft white but I am going with soft. They both Soft or hard red or white have wonderful nutrients. Making these right now and can’t wait. I have never made pancakes with sour cream. Ok, I just made them and they were okay. The batter was a little thin, so next time I may use less milk. But the taste was good. Only thing I did differently was use splenda and added cinnamon.